Busch Gardens is an action-packed, adventure theme park located in Tampa, Florida. It features six high-performance roller coasters, spectacular shows, shops, exhibits, wild animals and thrill rides. Some of its roller coasters are among the best in the southeast. More than just thrills, the theme park offers first rate animal attractions, shows and entertainment. Its Serengeti Plain is home to hundreds of exotic, African animals roaming freely across a 65-acre natural habitat. The park has a wide range of interests for family adventure for children, teens and adults. Busch Gardens truly offers a full day of entertainment. 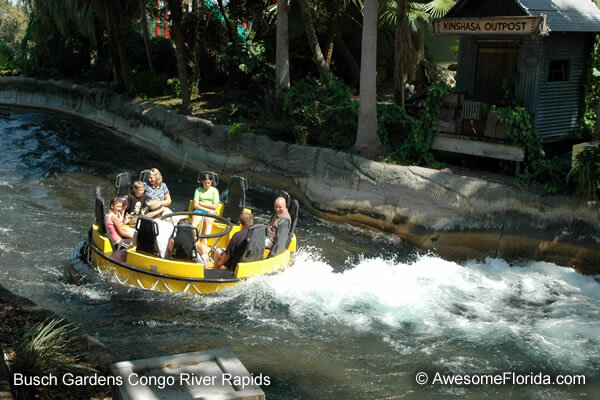 Float down the Congo River Rapids in a 12-person raft. Encounter swift flowing "white water", bump and bounce off of obstacles, encounter a waterfall and try to avoid guests as they fire water jets from the shoreline. Adventurers may get wet, which make this a popular attraction during the hot summer of Florida. A thrilling vertical tower launch adventure. The launch starts within a "crater" and zooms straight up for an awesome view of Jungala Village below. 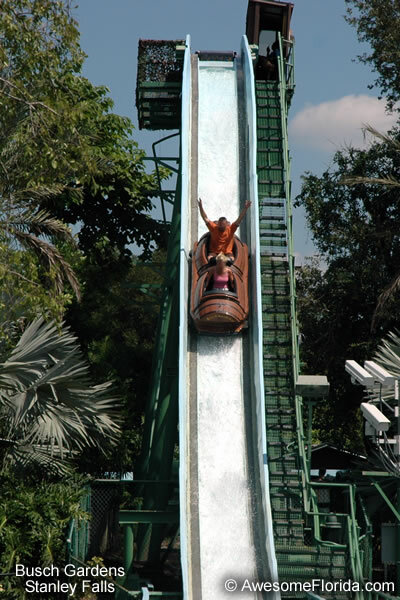 A log flume where visitors sit in a "hollowed out log" as it travels along a water track with winding turns and drops. The finale goes down a 40-foot sloping drop with a lot of water spray for an exciting end. A good adventure for the entire family. Some guests will get wet. 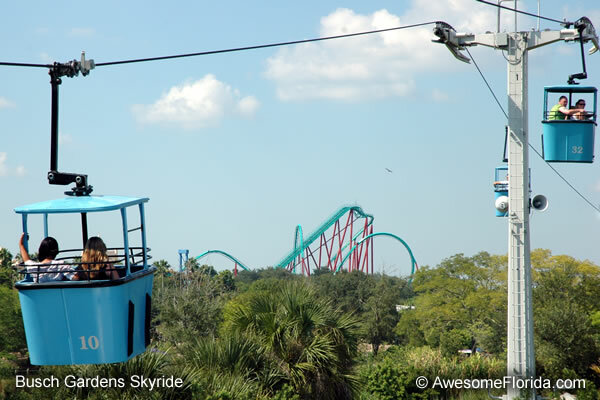 Enjoy the park from the sky on this pleasant cable-car sky ride. Board at either of the two sky ride stations near the Crown Colony or in the Congo. The cable car crosses over nearly half of the park. From this perspective one gains a better appreciation for the many attractions, roller coasters and animal wilderness. 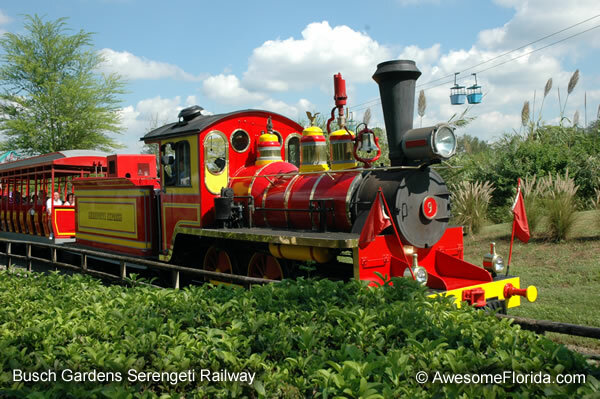 The Serengeti Express train meanders through and around the park including Stanleyville, Congo and the Serengeti Plain. A very relaxing and enjoyable ride as the beauty of the Serengeti Plain unfolds with its giraffes, zebras, antelope, gazelle, ostrich and other exotic African animals.